Email marketing is still one of the most efficient forms of marketing. Smart Campaigns put you in direct control of your email marketing efforts, allowing you to control what emails go to your customers. This level of control is invaluable and will allow you to make your customers happy, boost sales, and give your customers what they really want. Where other methods require materials, labor, and other costly services, email marketing doesn’t. On average, it costs less to run email marketing campaigns because you can blast thousands of customers at once. Traditional email marketing has its flaws. Companies spend countless hours developing their general email lists. Users are added to these lists through marketing initiatives and companies email users on their lists in order to try and promote new products and services. While this works to some degree, it doesn’t provide you with enough control. That’s where Smart Campaigns come in. Rather than blast an email and guess, Smart Campaigns let you control how emails are sent out, what happens, and provides you with a set of triggers and conditions that can further personalize your lists. A company can directly control the efficiency of their email marketing initiatives when they have the ability to create segmented lists. It’s important that you have the ability to send targeted emails to the right customers. Remember, a new customer is likely at a different stage than one of your VIP customers. If you were to send them the same email, you would receive mixed results. With segmented email sequences, you don’t have to. You can split your groups up and send personalized emails to them based on a set of predetermined triggers. Triggers: Users enter the sequence when they have filled their cart and abandoned it. This is the initial trigger event. Without this trigger being fulfilled, users will not enter this sequence. Conditions: When certain conditions have taken place, users will progress to the next stage of the sequence. An example of this would be delaying the initial cart abandonment email until 12 hours after the cart has been abandoned. Emails: Custom emails can be created for each step of a Smart Campaign. The first cart abandonment email may remind customers of their abandoned cart. Forks: You need to use forks to further customize your email sequences. Not all customers act the same. Some may respond to the first email and complete their check-out, while others will require additional nurturing. Forks let you create additional paths, each with their own conditions. Let’s break this example down. In this scenario, we’re going to work with the classic “Abandoned Cart” email. No matter how great your products are, customers will abandon carts from time to time. There are many reasons for this, but that doesn’t mean you shouldn’t try to convince them to check-out. 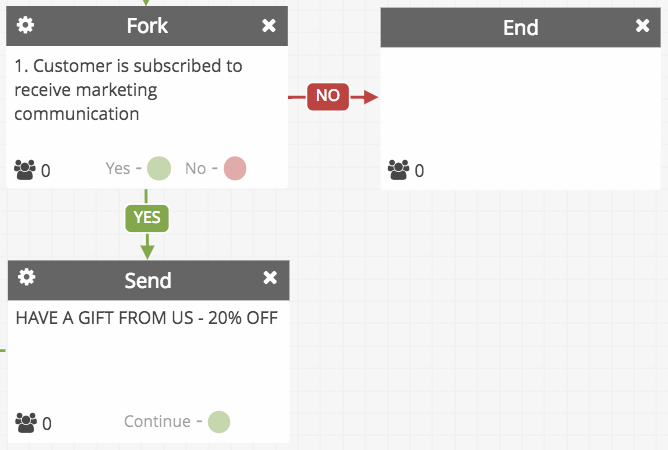 Using Smart Campaigns, you can control the entire abandoned cart sequence. As we mentioned above, users enter your Smart Campaigns through a specific trigger. Here, they abandoned their cart and were added to this sequence. After 12 hours, an email is sent to the customer reminding them about their abandoned cart. At 24 hours, a fork takes place. If the user visited the website, the sequence continues, if they did not, they are removed from it. Any users that remained on the list is then sent a second email that offers free shipping for their abandoned cart. Sometimes an offer like this is all a customer needs to complete their order. It’s a simple nudge in the right direction. When the user places an order, they are removed from this sequence. However, if the cart is still abandoned and the user is a registered customer, they are sent a third email offering 10%. At this point, no matter what happens, the customer is removed from the sequence. This was a simple example of a cart abandonment email. With Smart Campaigns, you stay in control of how your email sequences play out. This allows you to directly market to your customers, providing them with targeted emails and discounts that they will like. Smart Campaigns can be used for any type of email marketing. We’ve seen them used for cart abandonment emails, new user welcome emails, win-back emails, up-sells and cross-sells, buy-or-die sequences, VIP sequences, and more. There is no shortage to how creative you can get when you can directly control your email lists through specific triggers and conditions and the flow of the sequence through forks. A customer has received an email, is registered, or subscribed to receive emails. Triggers and rules are essential for categorizing your customers. A customer with an abandoned cart will have different needs than a VIP customer who has placed over 20 orders. By personalizing these email sequences, you are better able to nurture your customers. Conditions allow you to control the flow of your emails. Without time delays, your entire email sequence would get blasted out right away. In addition, you need to remove customers who have taken action in order to stop them from receiving unwanted emails. Forks help organize your email sequences, providing much-needed structure and customization where required. You need to know what your customers are thinking as they browse your website. Our real-time tracking provides you with the competitive edge you need to create a more personalized user experience. Recommend allows you to improve customer personalization in real-time. This information can be used to further improve your Smart Campaigns and overall marketing efficiency. Our platform displays detailed analytics reports that you can use to create Smart Campaigns that are extremely accurate. Data is important when it comes to eCommerce, but you need to understand how to make sense of that data. Some platforms bombard you with numbers that are difficult to understand. Our user interface is easy to use, simple to follow and provides you with a wealth of data that is displayed using simplified graphs and figures. When it comes to creating Smart Campaigns, each sequence is built piece-by-piece, with each step being customizable. It’s as simple as defining your trigger, setting conditions through the sequence, and using forks to piece it all together. We designed Recommend for customers just like you, because we not only know how important it is to collect insights on your customers, but also how important it is to be able to act on them. You asked, and we listened. Our development team worked hard to implement push notifications for both desktop and mobile users. We believe this will further boost personalization and allow for additional customization when it comes to engaging with your customers. Push notifications are a great way to remind your customers when to take necessary actions, like completing an abandoned cart, promoting trending items, and other marketing strategies. Very few platforms can do what Recommend does. When you use Recommend, there’s no need to patch together several tools. We’ve made it easy for you to collect valuable insights through our analytics suite, to make sense of the data using a simplified user interface, and to act on these insights through our new Smart Campaigns email marketing feature. Our goal is to create a more efficient marketing process for your business. Email marketing is a valuable tool. Use our new Smart Campaigns feature to customize your email marketing to reach your customers with precision. You’ll never have to worry about sending generic emails again. With Smart Campaigns, you can reach segments of your target audience with emails that appeal directly to them. If you have any questions about Recommend, or our new Smart Campaigns, feel free to contact a member of our team today.